We asked chefs to peek into their crystal balls and tell us what foods we’ll be talking about in five years. Here’s what they predicted. When we asked Chicago chef Graham Elliot what the future held for food, he had just this to say: “Beware the wok: It’s coming!” We believe him. Though woks are primarily used in home kitchens for stir-fries and fried rice, they are very versatile. Here, five ways you can use a wok beyond chicken chow mein. Sear scallops. Use a super-hot wok instead of a pan to get extra-crisp, beautifully golden scallops. They’re delicious in tangerine sauce. Fry chicken. Frying chicken in a wok leaves it incredibly crisp without any oily taste. Steam mussels. Using a wok to quickly steam mussels is a great alternative to putting them in a pot, plus you get some extra-smoky flavors. Smoke salmon. You don’t have to own a smoker to make amazing smoked salmon at home. Simply line a wok with foil, put down a mix of rice and black tea, place a wire rack above the mix, let it smoke for a bit, then add the fish and cover. The method also works for smoked cheese and shrimp. Make an omelet. 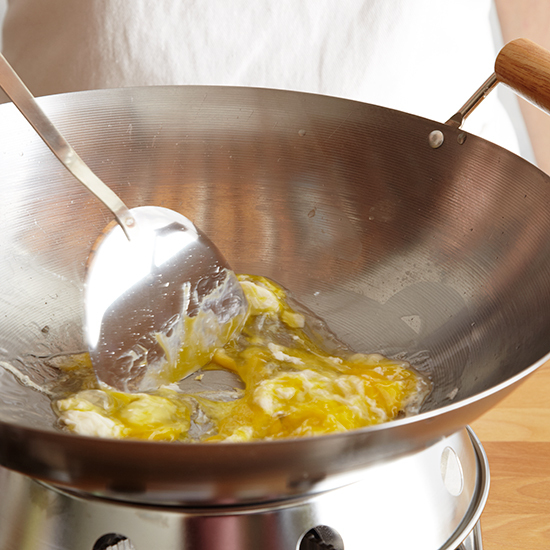 A hot wok creates light and puffy eggs.